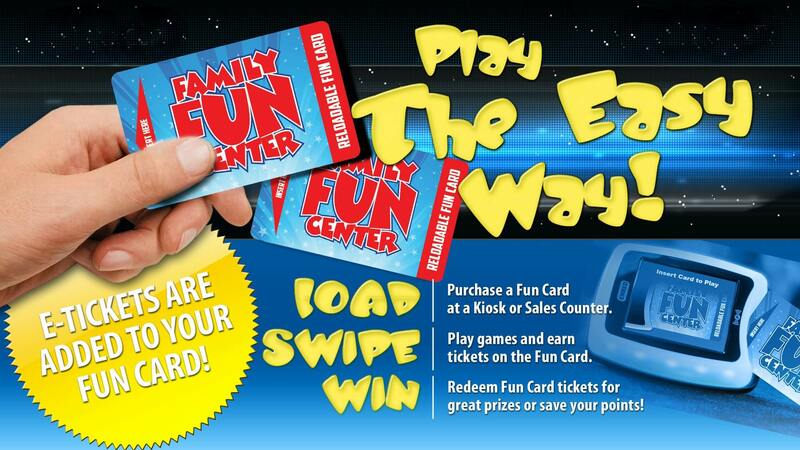 Check out our brand new Fun Cards, the easiest way to play at Family Fun Center! Family Fun Center’s Fun Card! If you follow us on Facebook, Twitter, or Google+, you have probably heard about it by now. If you have been by our facility, you may have seen it. Everyone is abuzz with excitement around here because recently, we unveiled of our newest way to play. We now have re-loadable Fun Cards that make it easier and more fun to play at Family Fun Center of Lakeland! Let us answer a couple questions about this awesome new card! 3.To play the same game again, you simply press the PLAY AGAIN button. It really cannot get much simpler than that! Does It Only Work On Arcade Games? Our easy-to-use Fun Card works everywhere in our facility! You can use it for concessions, arcade, Adventure Golf, laser tag, and our laser maze. It is easy, and versatile! How Does Ticket Redemption Work? At the end of the day, when you are ready to redeem your tickets, simply take your card (just like you would do with paper tickets) to our redemption counter. No more waiting in an endless line, because our Fun Card calculates exactly how many tickets you have, it is faster to get your prize! If you have not had a chance to come by yet, we definitely encourage you to put it on your calendar. Spring is officially upon us, and the weather is perfect, so bring your children or grandchildren, and have a great time with us at Family Fun Center of Lakeland with our brand new Fun Card!